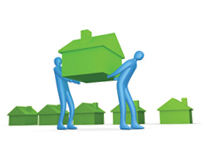 Have you been renting private accommodation since before the 6th December 2010? Did you know that you are entitled to tax relief at 20% on your rental payments each year? In order to claim rent relief tax refunds, you must be paying rent for private rented accommodation which is used as your sole or main residence. If you have rented in the last 4 years, you are likely due a rent relief tax refund. The amount that can be claimed depends on your personal circumstances but it is not available to individuals if they are renting from a Housing Authority. Contact us today to discuss if you can claim rent relief tax credits. The tax relief available is at the standard rate of tax, currently 20%. The maximum allowance that is available to a single individual under the age of 55 is €1,200. Therefore you will be entitled to a tax refund of €240 (€1,200 x 20%). The maximum allowance that is available for married people and for single people over the age of 55 is €2,400. Therefore you will be entitled to a tax refund of €480 (€2,400 x 20%).